It's time for the new challenge over at The Mixed Media Monthly Challenge. This month we have a super fun Word Search Challenge. 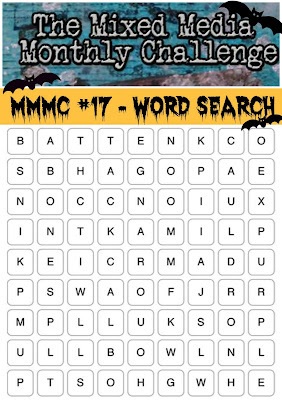 Just make a project based on any of the words you find in our Spooky Word Search. Be sure to tell us what words you used. I had so much fun with this challenge!! I put a sugar skull on a small wood block. Our awesome sponsor this month is Grumbacher. They make amazing artists paints and supplies. Our lucky random winner will win a Grumbacher prize package filled with India Inks, Acrylic Paints and Woodless Colored Pencils. Grumbacher was so generous they gave our design team member the same items in the winner's prize. Be sure to check out their products at your local craft store. 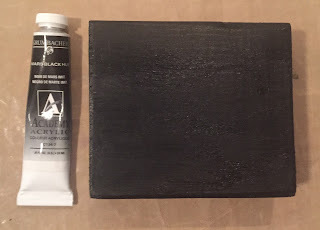 Here's how I made my project. First I painted a wood block that I got from a construction site with black Grumbacher Acrylic Paint. Next, I dripped some of the India Inks down the wood block. There are hard to see in my later images. 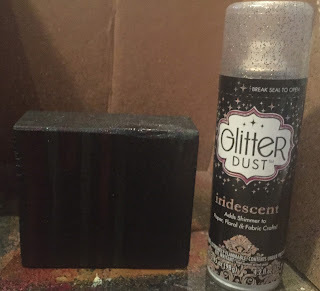 Then I sprayed it with Glitter Dust spray. It's hard to see in the picture here, but very festive and fun! I wanted to add more to my block so I then added a bone border. This was so easy. I just used a DecoArt Americana Writer in White to make a straight line. Then, at the end of each of the lines I made 2 small round shapes. The less uniform they were the better - they look more like real bones. I love that they were so easy and fun to make! 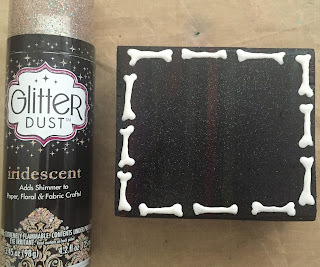 Finally, I feel like it need more glitter so I sprayed the block again with the Glitter Dust . 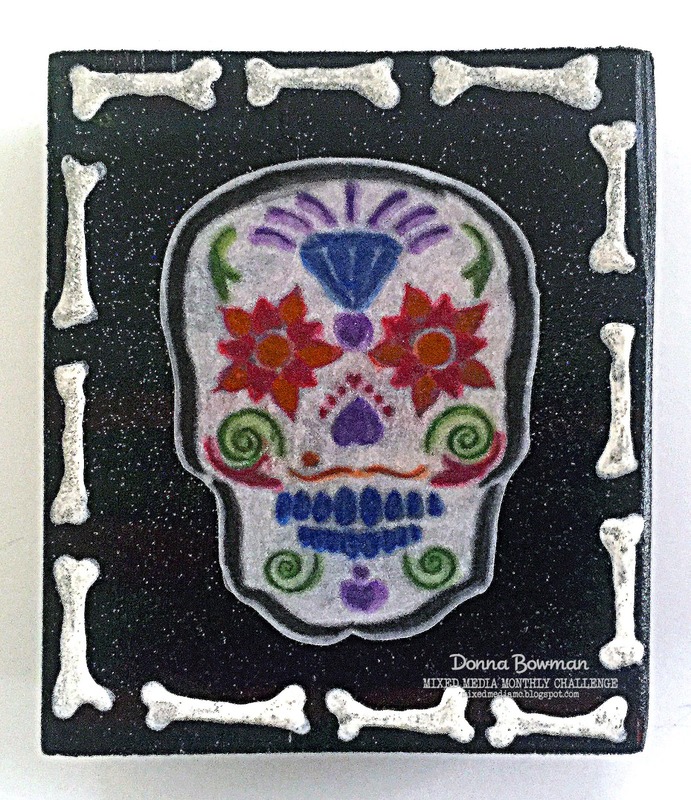 On a sheet of vellum I stamped a Hampton Art Sugar Skull three times with Ranger Archival in Jet Black. 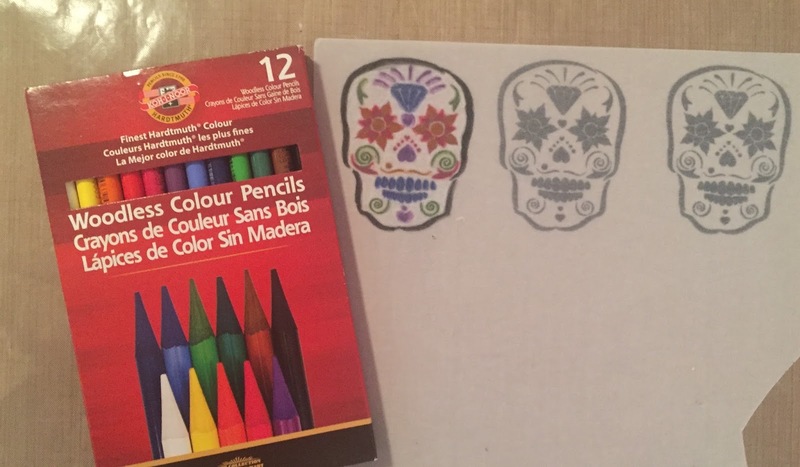 Then I colored in the Sugar Skulls with my Grumbacher Woodless Colored Pencilas. I put an uncolored one on the block first, then covered it with the colored Sugar Skull. The two piece of vellum made the skull seem much more white. Cool 3D project. Love the use of sparkle spray for the sugar skull finish. Oooh, I do love that sparkle! Really dimensional work. Skull looks almost felted. What a great mixed media page. 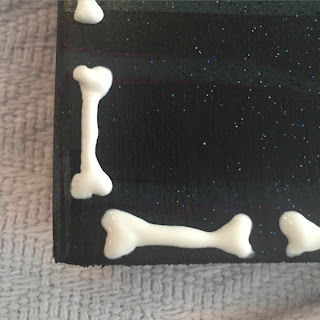 I loved how you created the bones with the supplies you had on hand. To me that is crafting. Thanks for explaining how you made this piece -- I thought the bones were premade embellishments -- super cool. That glitter spray looks wonderful.